A customer recently contacted me about making a modification to the height of a drop leaf Stickley End Table.The table was made in November of 2000 by the Stickley Furniture Company. 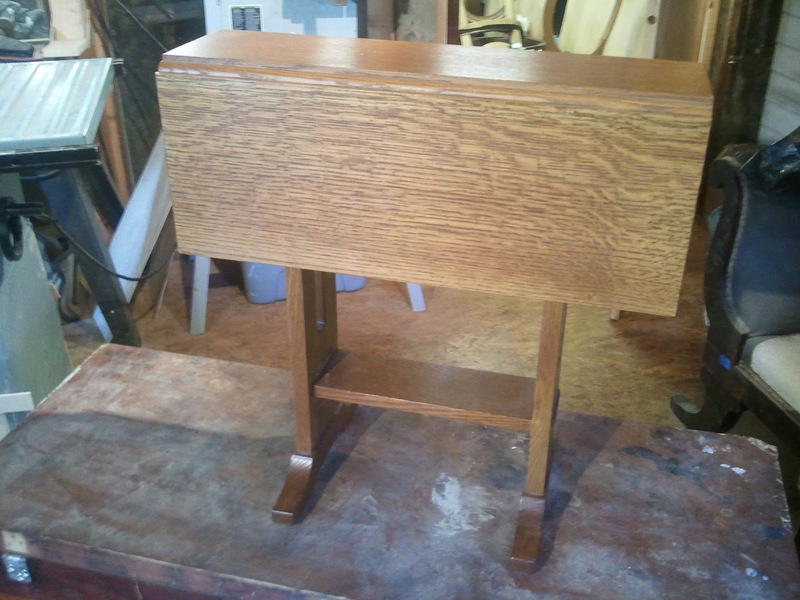 Like the famed Stickley furniture of the early 20th century, this table was made entirely of White Oak that had been quarter sawn. 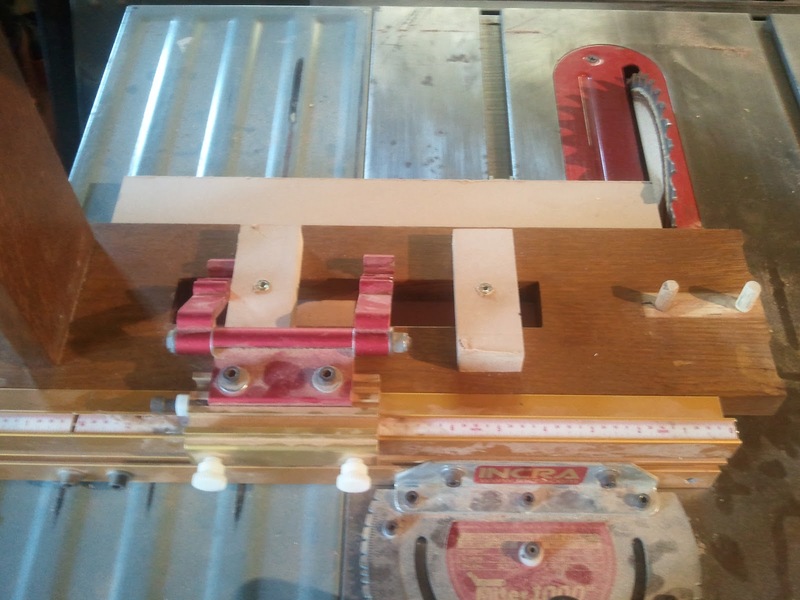 To quarter saw a board means to cut the board so that the faces of the board are sawn radially. This means that when the wood is viewed from the end grain, the growth rings appear to go straight up and down. Because the grain is oriented this way, the wood is less prone to cupping and bowing and it is generally more stable. As an added bonus, this type of cut shows off the medullary rays of the wood, or simply rays. In certain woods (like Oak) these are quite pronounced and appear as lightly colored streaks running diagonally across the grain.. By using radially cut (or quarter sawn) lumber, A designer can make the most visually of Oak while also creating a piece with stability. In this case, form and function go hand in hand! As stated before, this table was made recently and had no problems. 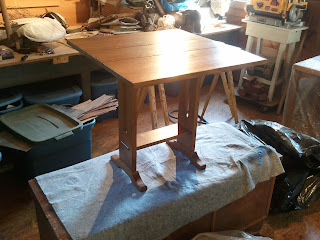 The only request was to shorten the table by 1.5 inches. The following photos show the table and the process of cutting it down to the requested size. Here are a few photos of the table as it came to the shop. 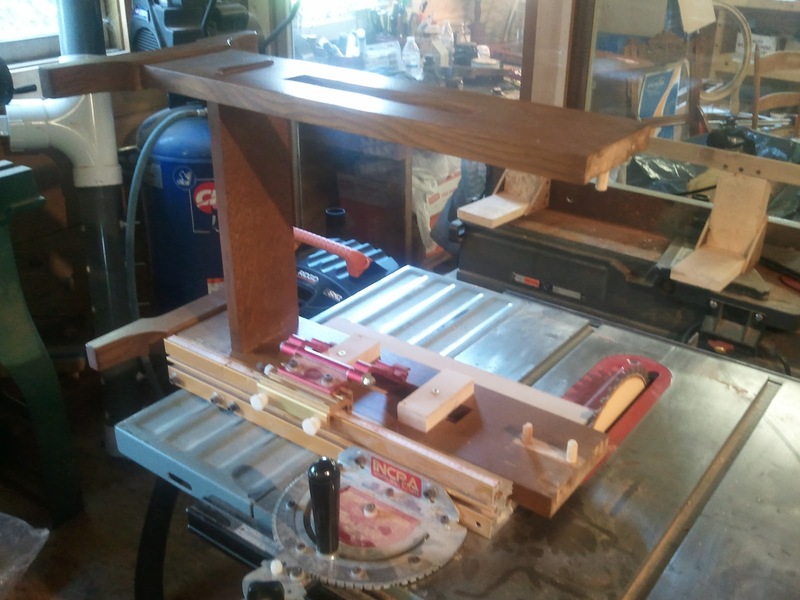 The base of the table is made utilizing a trestle design and contains mortise and tenon joinery both in the feet and in the shelf which connects the two legs. 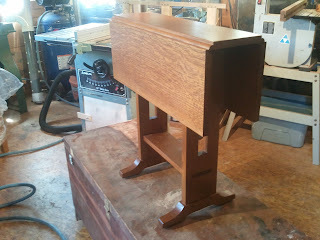 This joinery was sound and to try to knock it apart meant that I might possibly damage the piece. In addition, cutting an inch and half off of the base would mean that the shelf would be that much lower. This would be visually unappealing, so the decision was made to remove the top and cut the tops of the legs down to lower the top. 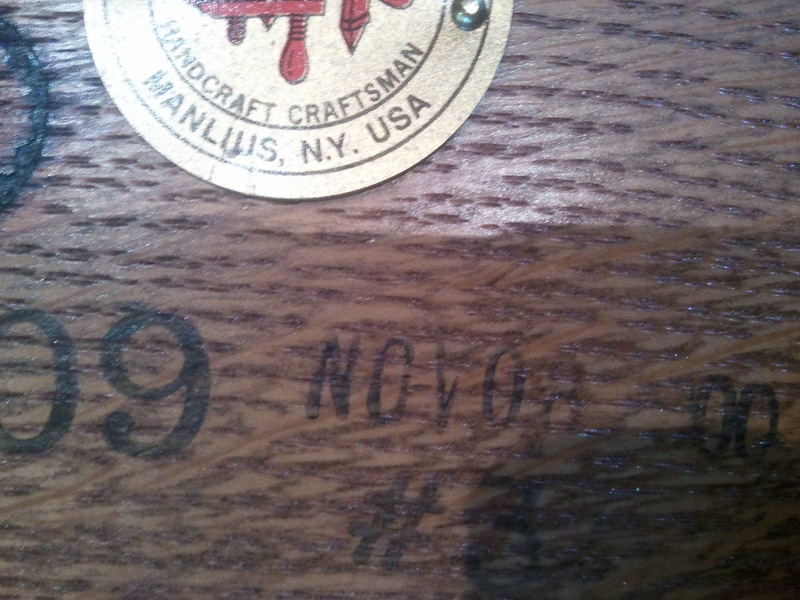 Following the photos of the table below are two photos showing the Stickley label and the date of manufacture. 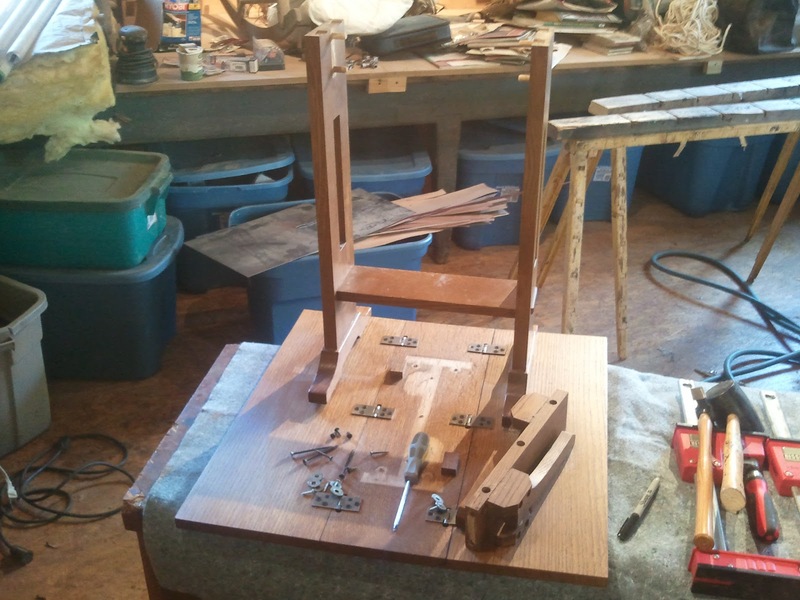 Once the top was removed from the legs, the leaf support system was also removed, leaving the legs attached by the shelf near the bottom. 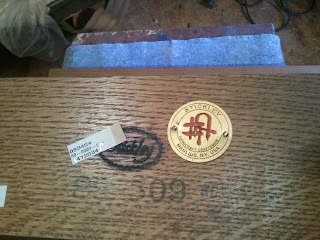 As I said earlier, this joinery was tight and would have damaged the piece had I tried to knock it apart. I decided to work with the legs while they were together. The photo below shows the legs with the leaf supports and top removed. The leaf supports were held in place with dowel joinery, which made that part easier to remove than the rest of the piece which had tenon joinery. The tenon for the shelf was actually called a through tenon, meaning that the tenon extends through both faces of the board that it is mortised into. 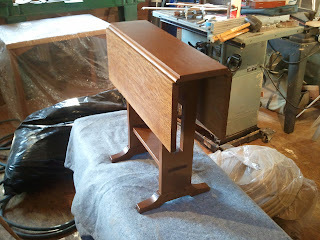 The tenon protrudes slightly on the other side and the end is tapered. 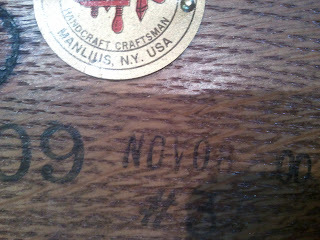 This design element is seen frequently in Arts and Crafts furniture and has a nice look. 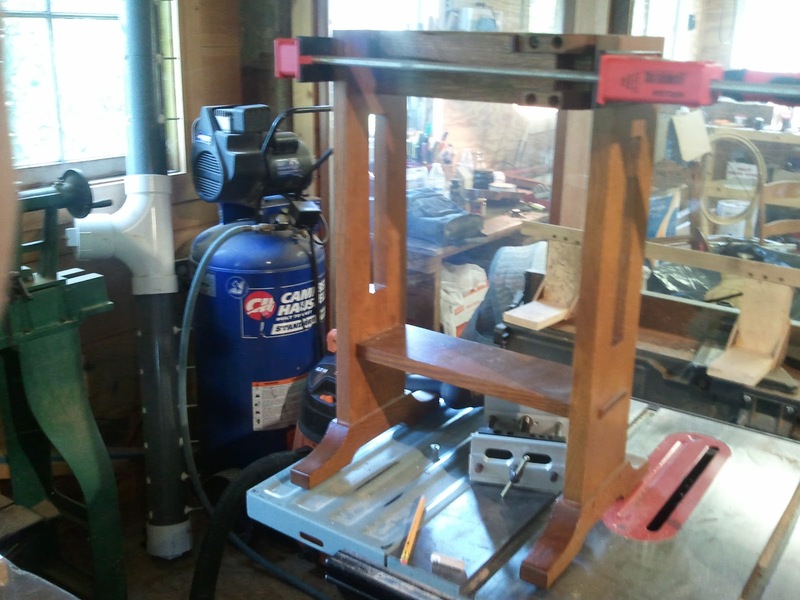 This through tenon and the feet on the base provided a challenge in cross cutting. I needed to be able to lay the face of the leg flat on the table saw so that I could make a square cross cut. 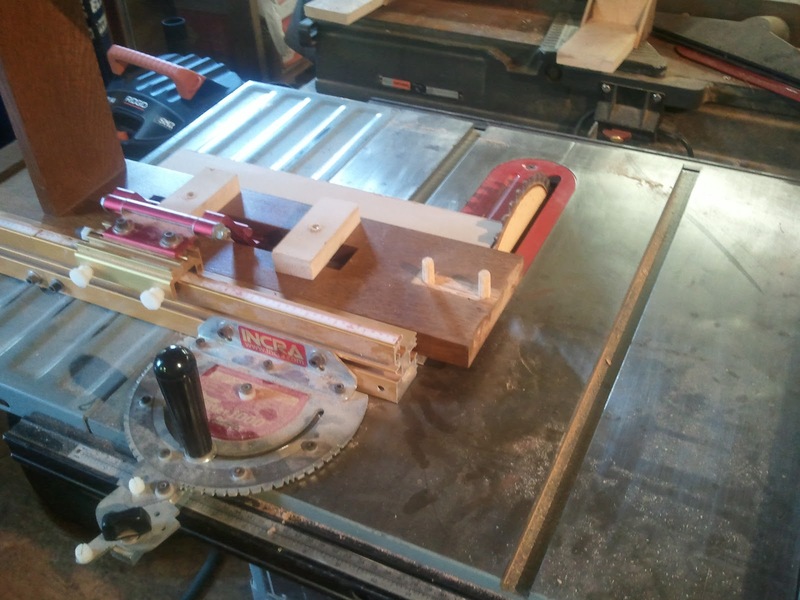 I got around this problem by creating a sled which was fastened to the leg raising the whole leg off of the surface of the table saw. The sled only made contact with the flat surfaces on the leg. The result was that the leg laid flat on the surface of the table saw. Once this was accomplished I used a cross cut saw to remove 1.5 inches from the top of each leg. The photos below show this sled in action. Once the cuts were made, new holes were drilled for the dowels which attach the leaf supports. 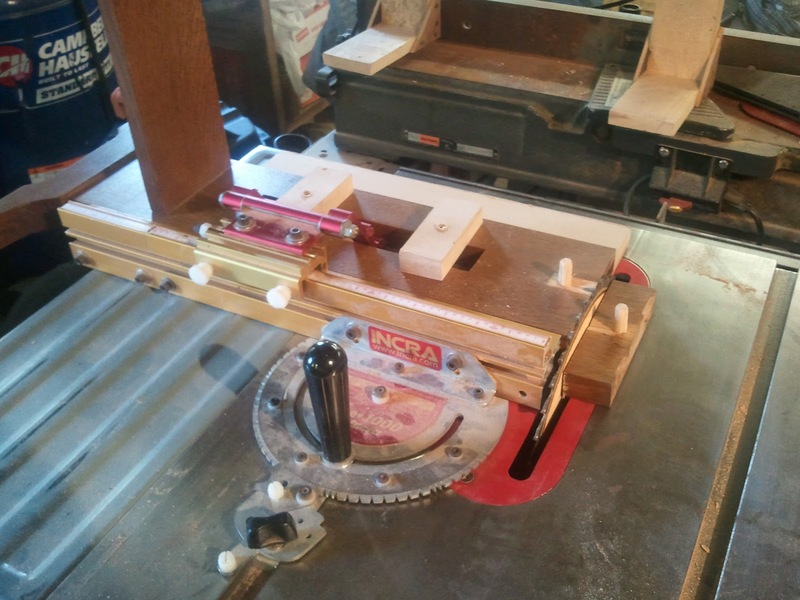 This process was accomplished by using a dowel centering jig to center the drill and make the holes in the right location. The photo below shows this work. 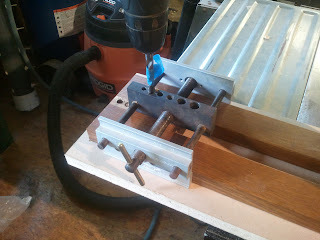 After the dowel holes were drilled the leaf supports were reattached and glued in place as seen in the photo below. The last step was to attach the top. 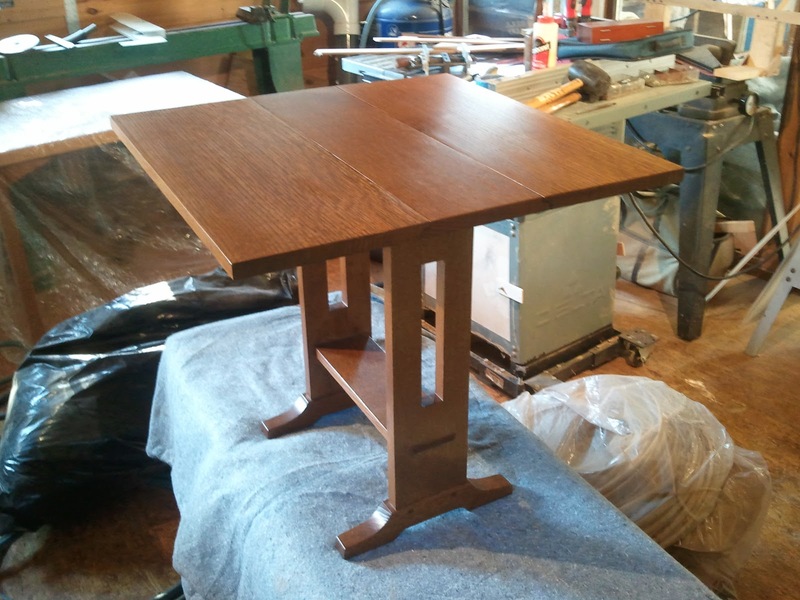 The modified table can be seen reassembled in the photos below.. By taking the 1.5 inches off of the top, the height was adjusted while leaving the overall design intact and visually appealing.